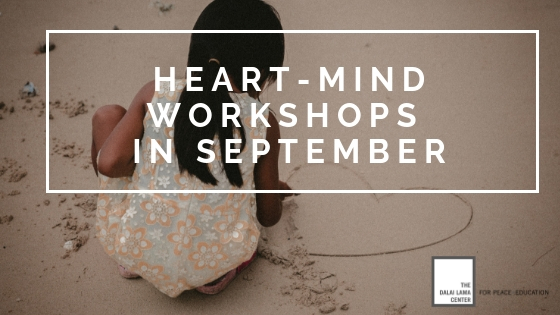 We Have Two Heart-Mind Well-Being Workshops Coming Up This September! This month we have two upcoming Heart-Mind Well-Being workshops! The first is our signature workshop: Heart-Mind Well-Being on Sept. 19th, 2018. We share current research, best practices and practical strategies related to the promotion of social and emotional development in children, youth and adults. If you have not attended one of our workshops before, this is the perfect one to start with. The second workshop: Heart-Mind Well-Being: Parent and Caregiver Workshop is on Sept. 27th, 2018 and is specifically for parents and caregivers. By exploring the latest research in social emotional development, self care strategies that include mindfulness and breathing activities, and your own personal experience as a parent or caregiver, participants will be supported in identifying ways to enhance their own Heart-Mind well-being and that of the children in their lives. Copyright © 2018. The Dalai Lama Center for Peace and Education. All rights reserved.